The Island of Imagination sits across from the Peninsula of the Outside World in the Sea of Imagination, which the locals call the Hayal. One of the Boatpeople from the Village will take you across. On the Island, there are all seasons and weathers for us to enjoy, places to discover – mountains, grasslands, forests, and caves. We can walk to a waterfall, the rooted tree or standing stones. We can think, or just relax and breathe fresh air. The viewpoint on the cliffs is a great place to watch the sun rise and set, or look at the moon. We can rest, spend time alone, or with the extra-ordinary creatures and beings who reside here, who might act as our guides or companions or become part of our story. In the Community, the Monsters welcome and take care of us. We stay in a clean and cosy cottage, lit by oil lamps and candles, sunlight and moonlight. There is an open fire and a comfy bed with blankets and a patchwork quilt. Amongst buildings made of stone and wood is a library of books and pictures from all over the world. It has curved walls and a glass dome observatory on top to look at the stars. On the Island we are free to go wherever we like, wander and explore, go into the wilderness, to follow our own path. We can stay in little cabins that are dotted around, or camp out. If and when we are ready, we can venture off the map into Uncharted Territory. The Compañeros and Criatura will prepare us for this with thought and care. The Monsters, Animals, Myth Creatures and Other Beings will assist us, perhaps even carry us for a while. They give us space to find our own ways and our own pace as we embark upon each new stage of our journey. You are always welcome on the Island of Imagination. 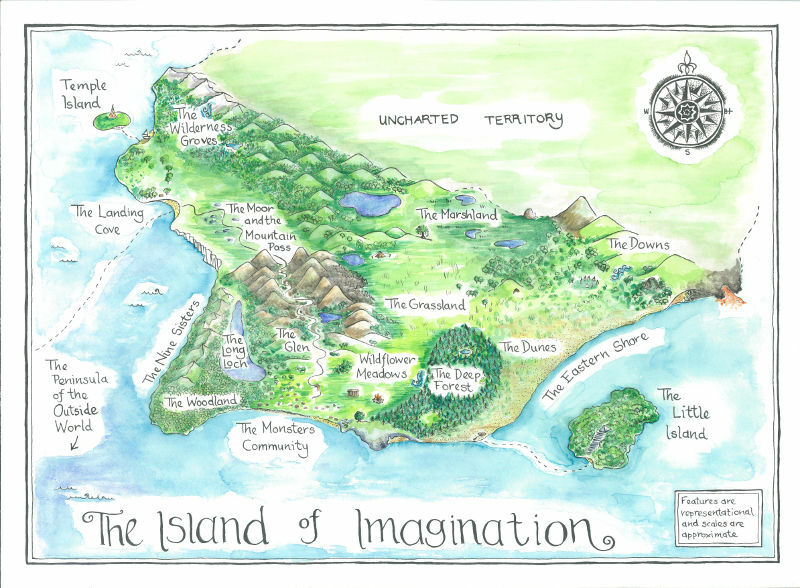 Click your way through the text or image menus, the tag cloud, search engine, or follow the links on each page, to navigate and explore the Island of Imagination.